Researchers from Deutsch Telekom Laboratories and Finland's Aalto University have claimed it is possible to detect the CPUs of servers powering at Amazon Web Services' (AWS') Elastic Compute Cloud (EC2), and that the fact the cloudy giant uses different kit in different places means users can select more powerful servers at the same cost charged for lesser hardware. The claim has come to light in a paper titled Exploiting Hardware Heterogeneity within the Same Instance Type of Amazon EC2 (PDF) that was presented at the HotCloud event last June, but which seems to have largely gone unremarked-upon since that event. Over the last week, however, the paper has bubbled up into the blogosphere, and is now being quite widely discussed, thanks to its finding that “... Amazon EC2 uses diversified hardware to host the same type of instance” so that an instance hosted in one AWS data centre can be faster than the same instance, sold at the same cost, in another facility. The researchers say they figured this out by peering through AWS' hypervisors to identify the CPUs on the bare metal beneath. Doing so, the paper says, revealed the presence of AMD Operon and Intel Xeon processors, both with different clock speeds. The researchers were also able, thanks to their use of a longitudinal study that employed two study periods in 2011 and 2012, to detect Opteron prevalence falling in favour of newer Xeon kit. 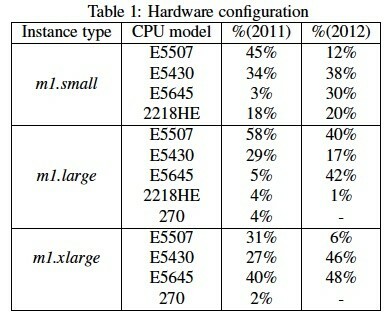 The results are depicted in the table below, which shows the different CPUs used in EC2 instances during 2011 and 2012. That change in CPU usage was even observable at different rates in different AWS availability zones, making it possible for the savvy to aim their instances at different AWS facilities to take advantage of newer hardware. The researchers think they may also have spotted a new data centre coming online, as they spotted a facility where 95% of all CPUs were of the same type. The paper goes on to imagine a regime in which EC2 users could, using a census of processor types across AWS' ifrastructure, create a virtual machine, interrogate it to learn what CPU powers it, and if it uses a slow CPU discard it in the likelihood of securing a faster virtual machine based on the likelihood of securing a faster CPU given the ratio of different CPUs among the data centre's server population. Even though AWS charges for an hour of computing time whenever a server is invoked, the paper asserts the extra computing power could pay for itself. The paper does not advance a method for putting such a regime into practice, but nor does it suggest AWS would be hostile to such an effort.